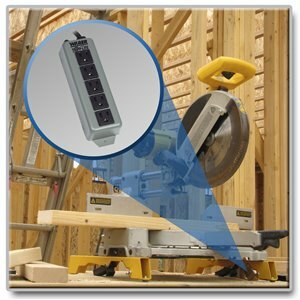 The Waber-by-Tripp Lite 602 Power Strip offers a convenient method of power distribution in workbench, wallmount or floor mount applications. Includes 5 NEMA 5-15R output receptacles with 1.188-inch center-to-center spacing, 6-foot AC line cord and keyhole mounting tabs for installation in a wide variety of applications. Corded, multi-outlet strip reduces cable clutter and enables the connection of multiple electrical devices to a single AC wall socket. Unfiltered electrical pass-through makes the 602 ideal for distributing alternate waveform UPS or generator power. Features rugged all-metal housing, 15-amp resettable circuit breaker and attractive color scheme. Featuring a rugged metal housing, five AC outlets with 1.188-in. center-to-center spacing, 6-ft. cord and heavy-duty, 15A resettable circuit breaker, Tripp Lite’s 602 reduces cable clutter and connects multiple electrical devices to a single AC wall socket for physically-demanding applications where multi-outlet power distribution is required. The 602 provides reliable, unfiltered, alternate waveform electrical pass-through, making it ideal for distributing power from a UPS or generator to supported equipment. The 602’s switchless design eliminates accidental shut-off. A built-in, 15A resettable circuit breaker prevents dangerous circuit overloads that could damage equipment by immediately shutting off AC input when it detects that the equipment load is drawing too much power. For optimum safety, the 602 is tested to UL standard 1363. The 602 is backed by a lifetime warranty. As part of Tripp Lite’s commitment to environmental responsibility, it is manufactured in compliance with strict RoHS specifications.